In order to make Song Reader more authentic, Beck filled out the artwork with fragments of songs/melodies, as well as made-up album collections with fictional titles. 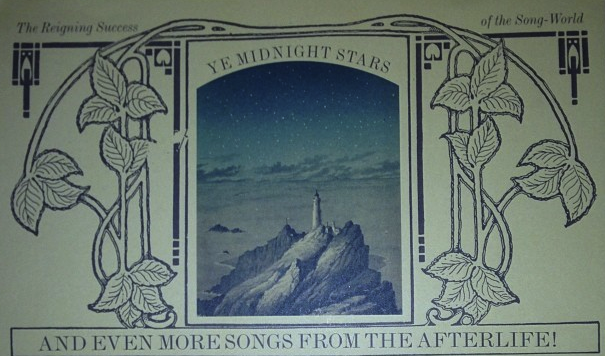 For instance, on the back of "Heaven's Ladder" is an album referred to as Ye Midnight Stars - And Even More Songs From The Afterlife. The centerpiece of that album is a short verse of a song called "Ye Midnight Stars," which is one of the longer fragments in the book. The lyrics here are really quite well-written, and I'd love to hear a fuller version of it and learn where the song goes. Prior to Song Reader, Beck had registered two songs in the copyright database called "Constellation" and "Tournequit." (He then also registered "Ye Midnight Stars.") Looking at the lyrics here, it seems possible one of those could have changed names to "Ye Midnight Stars." Regardless, "Constellation" and "Tournequit" remain unheard; whether they are different or related here is unknown. Also you can hear versions of the song here.